Issues seven and eight really tie up some loose ends with the story we’ve been working on. Diane finally comes clean about what’s been going on; she’s actually Artemis, the goddess. Zeus (her father) decided that the best way to choose who should get limitless power was to have a scavenger hunt type competition between Artemis and her twin, Apollo. 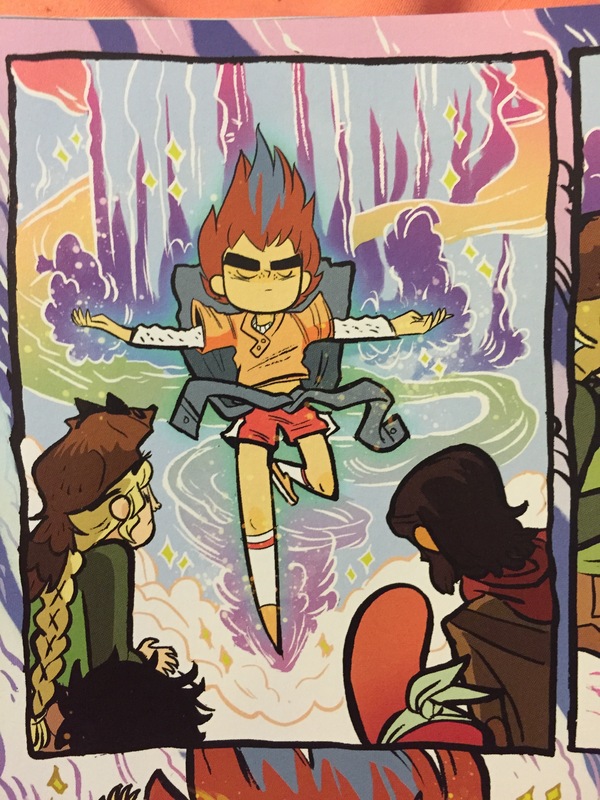 Diane/Artemis then explains that the reason things have been getting so wacky for the Lumberjanes is because Jo was holding onto the golden eye. They combine the golden eye with a crystal they snuck out of Rosie’s cabin, and a deer appears to show Artemis the way. 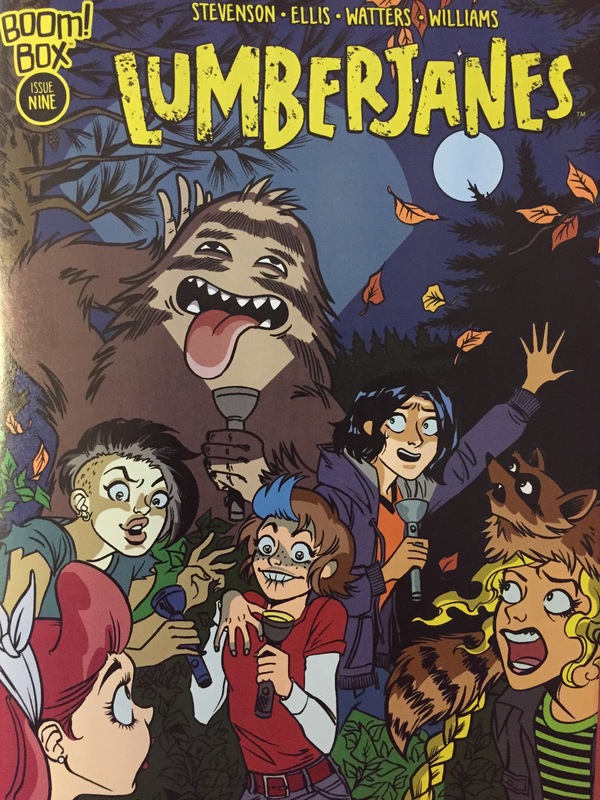 They end up at the cave the Lumberjanes stumbled into a couple issues back, so the gang of girls breezes through the tasks. Something’s new at the end though. They look like lightening bugs, but they definitely aren’t. Massive bugs start attacking the girls and zapping them; it looks like they’re getting into pretty bad shape. Diane/Artemis tells Jo there’s only one way to help the friends, and that’s to put the crystal and golden eye into a platform. This freezes all of the bugs, but also turns Jo into stone. Artemis tells the Lumberjanes that she will turn Jo back if they tell her where the contest is, so Jen deciphers the star map on the wall; saying its at the lighthouse. Just then, Apollo shows up (with the boys camp he has hypnotized) so he and Artemis fight to the lighthouse, leaving the boys and Roanoke cabin to fight it out. While the fighting is happening, Molly has to figure out the anagrams on the wall, to see how to unfreeze Jo. She can’t concentrate, so Mal gives her a big smooch, and she deciphers it; “your friends will be there for you.” That knocks all the boys on their booties, and unfreezes Jo. But they’ve still got to stop Artemis and Apollo. Jen tells everyone that she gave the twins the wrong information, and that the ceremony will be at the Lumberjanes camp instead. Luckily, the Roanoke girls get there first, and Ripley ends up with the powers. She makes four wishes; that Bubbles gets a funny hat, that Artemis and Apollo can’t hurt anyone ever again, that everyone has kittens, and that the power is gone forever, saving the day. Rosie apparently knew what was going on the whole time, and called Zeus to come pick up his kids. Issue nine is a little bit different from what we’ve been seeing. It features all of Roanoke cabin (including Jen) telling ghost stories. 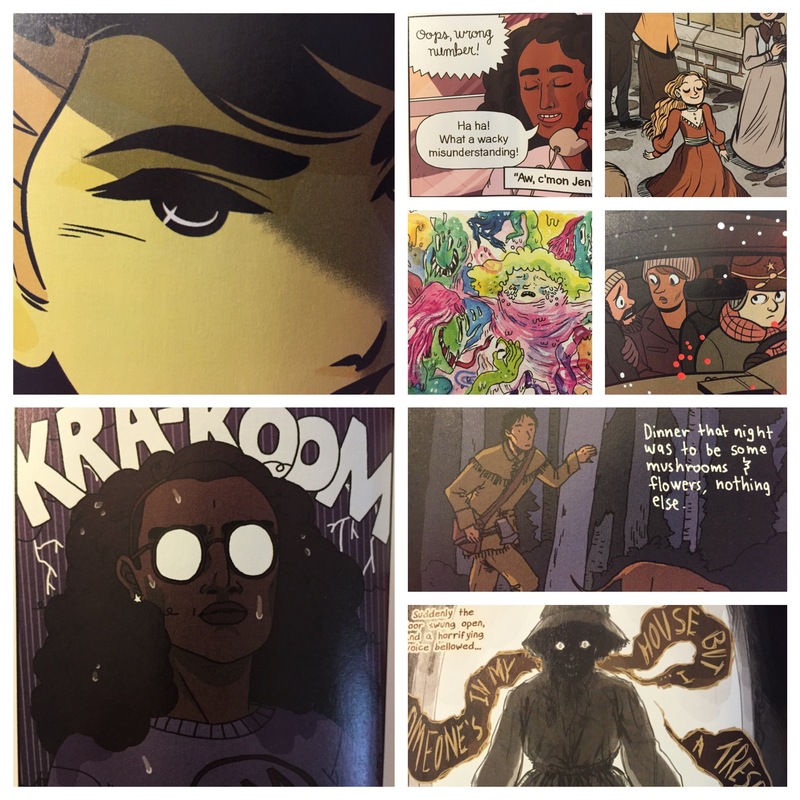 It’s a great little one shot that doesn’t really affect the regular storyline at all, but is nice, because there is a different artist for each ghost story; each with an incredibly different style. 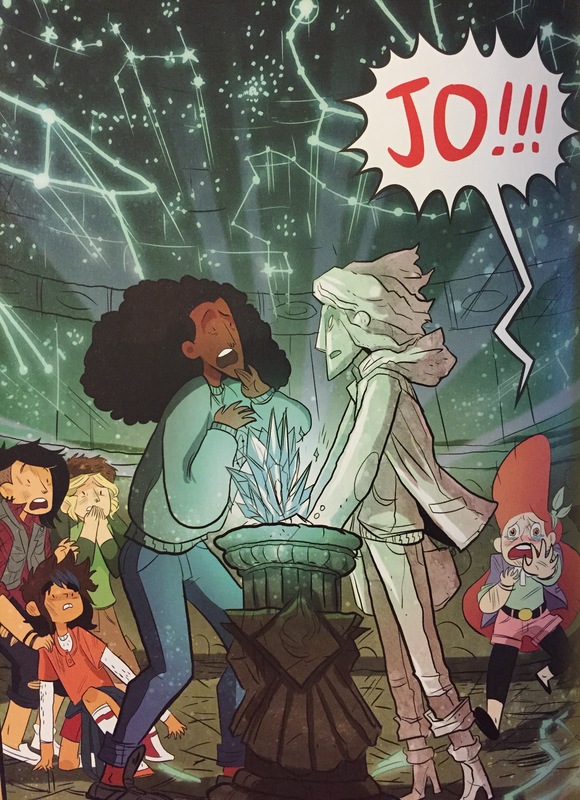 The artist who did the in between parts, Brittney Williams, did my favorite work within the book, but below is an example of all the different arts in it. Clockwise from the close up of Mal on the top left; Brittney Williams, Aimee Fleck, Faith Erin Hicks, Becca Tobin, Carolyn Nowak, Felicia Choo, T Zysk, Brittney Williams. 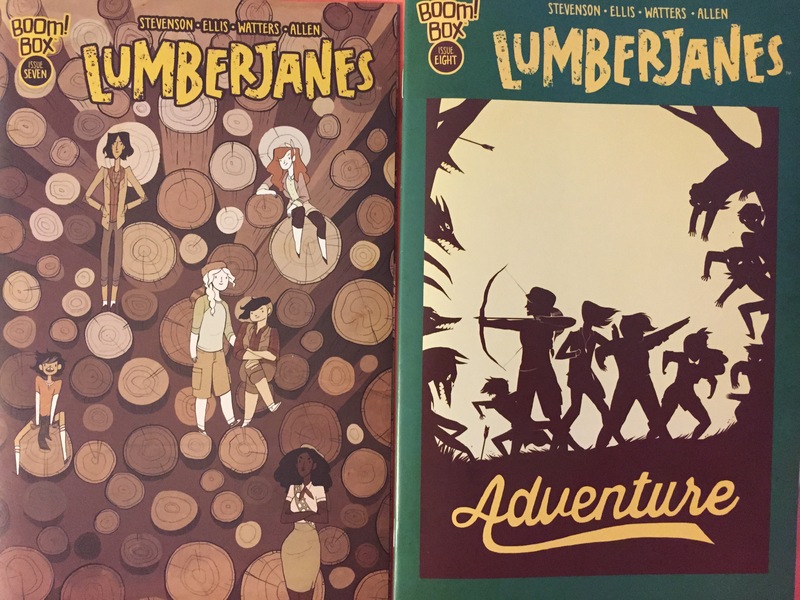 As we all know, I’m just so dang pumped about Lumberjanes. I wanted to catch up a bit, so I lumped all of these issues together, and I’ll be doing the same next time. These ladies are lovely, and you need to be reading their stories (plus it’s great to support a comic that has exceeded its expectations and original issue count).